When Belmont Grosvenor pupil Lola-May Hardcastle became school charities prefect, the 10-year-old knew exactly what she wanted to do. Her brother Teddy had almost died after suffering a severe brain haemorrhage that was only detected when he was a few days old. The second-born twin was rushed to Leeds General Infirmary and underwent emergency neurosurgery, followed by a series of operations to save his life, and spent his first few months in Leeds Children’s Hospital, where it was also discovered that Teddy was suffering from the blood clotting disorder Haemophilia B. Now four-years-old and a happy and healthy little boy, Teddy, along with his twin brother Harry, is a pupil at Belmont with sisters Lola-May, and Sienna, aged 8. On her appointment as Charities Prefect, Year 6 pupil Lola-May was determined to champion the work of Leeds Children’s Hospital, and its partner charity Leeds Cares. She persuaded Belmont Grosvenor’s Parent Teacher Association to choose Leeds Cares as its charity for 2019 – and this week community fundraisers dropped into the Harrogate school to speak to pupils and staff about their work, and explain how the school’s fund-raising efforts will help children like Teddy. 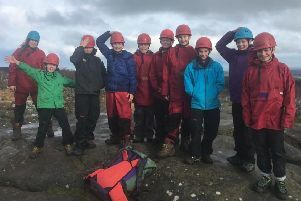 Belmont Grosvenor, based at Swarcliffe Hall, Birstwith, is set in 20 acres of grounds just a few miles from the centre of Harrogate, and welcomes boys and girls from three months to 11 years. Mum Laura Hardcastle said she was extremely proud of Lola-May for being chosen as Belmont Grosvenor’s Charities Prefect, along with fellow pupil Alice Baldwin, and for being the ‘most loving, kind and wonderful sister to her three younger siblings”. She added: “We, as a family, owe a lot to the Leeds Children’s Hospital. “We always reflect on how different things could have been without the care of the hospital and the staff – we can vouch first-hand to the truly remarkable level of care provided for Teddy. “He had a difficult birth and suffered a severe intracranial haemorrhage as a result – his chances of survival were low and it was likely that if he did survive he would be extremely disabled due to the extent of damage to his brain. “Despite the significant scar tissue in Teddy’s brain, he continues to grow and develop in the same way any other chid does. He continues to amaze us daily, and is growing into a strong, confident, capable, loving and handsome little boy,” she said. Already staff and pupils at Belmont Grosvenor have organised a pyjama day to help raise money for Leeds Cares, and other fundraising activities planned include a colour run in May and the school’s annual summer ball in July. Kevin Gerrie, Director of Fundraising at Leeds Cares said the charity was delighted to have been chosen by Belmont Grosvenor: “Leeds Cares is the charity partner of Leeds Teaching Hospitals which means we support all the patients who receive care here, along with the staff who provide it. We fund everything from research and innovation projects, through to much-needed equipment on the wards. “The school’s fundraising for Leeds Children’s Hospital will provide vital funds that will mean staff can continue to provide exceptional care like that given to baby Teddy. We’re really excited to see what fundraising activities are planned for 2019!” he said. Hannah Parker, Charities Co-ordinator at Belmont Grosvenor, said: “As a school we have a strong sense of community and a tradition of raising money for local good causes The children, staff and parents at BGS are looking forward to supporting Leeds Cares, and Leeds Children’s Hospital, to say thank-you to the support they have provided Teddy and his family. “One of our first activities to support Leeds Cares is to collect Easter treats to deliver to hospital for children and their parents to enjoy,” she said.